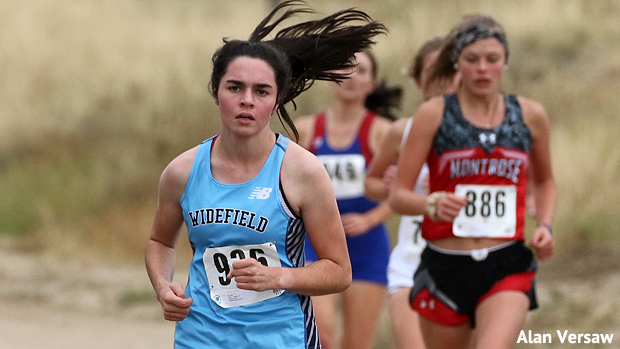 For years, Colorado cross country coaches have bemoaned the dearth of soft-surface cross country courses around the state. They now have another to add to a rather short list. With a new configuration around the campus of Fountain-Ft. Carson High School. the Fountain-Ft. Carson/TCA Invitational joined the list of leg-friendly courses around the state. Not only is it leg-friendly, but it feels like a cross country course. The course combines grass, path, and ditchbank two-track for a pleasant bucolic kind of feel. Actually, this year's course ended up with fix or six steps of hard surface for most runners owing to a shortage of mats to fully cover a couple short sections where the trail crosses concrete walkways. The distance covered over grassy surfaces will prevent this one from ever being counted among the state's "screamer" courses, even though the course is relatively flat by Colorado cross country standards. The mix of teams was, in a word, eclectic. Dakota Ridge, arguably the best boys program in the state this year (and there is an argument to be settled there--be sure to be at state in three more weeks to find out how it settles), was there. Local schools Widefield and Mesa Ridge signed on. Close, but not quite local, schools such as Harrison, Sierra, Palmer, and Pueblo East came to test out the new course. Taking honors for longest trip to the meet was Montrose. And some of the smallest programs in the state--Custer County, CIVA, and Denver Academy came as well. It's probably not difficult to discern which school won the boys team title, but there were many more stories to be told as well. To find out about those stories, get your finger in position and start clicking.